The Simpsons: Tapped Out Holiday Update- What's New? Get in the spirit with Santa's Little Helper, Funzo and snow angels. 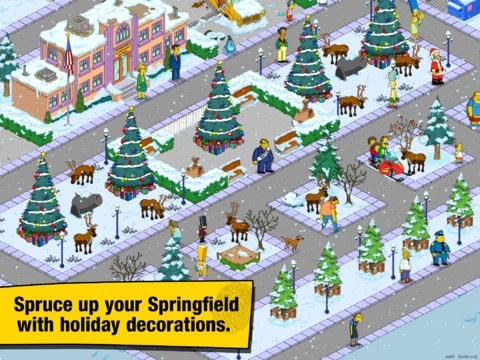 There's snow falling in Springfield, providing you update EA's The Simpsons: Tapped Out. The new holiday update comes with exclusive characters, buildings and quests. In other words, what are you waiting for? Download it pronto, refill your donuts and enjoy the spirit of the season. That said, here's a more detailed look at what you'll find. Holiday Themed Content Ends January 3, 2013! -Collect Santa Coins from Holiday Trees, Christmas quests, Christmas jobs and friends' towns. -Use Santa Coins to decorate houses. Decorated houses generate more Santa Coins. -Use Santa Coins to buy buildings and characters. From what we've seen, only a handful of characters have new holiday quests and rewards. These include, but are not limited to, the following. Homer: Make a Snowman, 16 hours. Eight Santa Coins, 125 XP. Homer: Pretend to ski, 10 hours. Eight Santa Coins, 90 XP. Lisa: Make Snow Angels, five hours. Two Santa Coins, 50 XP. Ned: Take the Boys Snowmobiling, 10 hours. Six Santa Coins, 90 XP. Get ready to splurge on these high-end goodies. -Santa's Sack (Five Donuts, Requires Christmas): Contains 10-20 Santa Coins. -Santa's Village (200 Donuts, Requires Christmas): Earns 25 Santa Coins every 24 hours. Comes with Santa Homer. -Holiday Tree (75 Donuts, Requires Christmas): Earns 10 Santa Coins and 10 XP every 24 hours. -Reindeer (20 Donuts): 0.50 percent bonus money and XP to all Jobs. -Krustylu Studios (140 Donuts, Requires Christmas): Earns 150 bucks and 17 XP every five hours. Comes with Sideshow Mel. As you'll soon learn, there's plenty to do in this winter wonderland. Here's a look at the various decorations and characters. -Christmas Simpsons Home (Requires Christmas, Pt.2): Generates five Santa Coins every 24 hours. -Christmas Brown House (Requires Christmas, Pt.4): Generates five Santa Coins every 24 hours. -Christmas Flanders Home (Requires Christmas, Pt.3): Generates five Santa Coins every 24 hours. -Christmas Cletus Farm (Requires Christmas, Pt.4): Generates five Santa Coins every 24 hours. -Christmas Purple House (Requires Christmas, Pt.4): Generates five Santa Coins every 24 hours. -Christmas Blue House (Requires Christmas, Pt.4): Generates five Santa Coins every 24 hours. -Christmas Van Houten Home (Requires Christmas, Pt.4): Generates five Santa Coins every 24 hours. -Christmas Pink House (Requires Christmas, Pt.4): Generates five Santa Coins every 24 hours. -Christmas White House (Requires Christmas, Pt.4): Generates five Santa Coins every 24 hours. -Christmas Willie's Shack (Requires Christmas, Pt.4): Generates five Santa Coins every 24 hours. -Christmas Orange House (Requires Christmas, Pt.4): Generates five Santa Coins every 24 hours. -Christmas Muntz Home (Requires Christmas, Pt.4): Generates five Santa Coins every 24 hours. -Christmas Krabappel Apt. (Requires Christmas, Pt.4): Generates five Santa Coins every 24 hours. -Christmas Frink's Lab (Requires Christmas, Pt.4): Generates five Santa Coins every 24 hours. -Christmas Volcano Lair (Requires Christmas, Pt.4): Generates five Santa Coins every 24 hours. -Mapple Store (Requires What's a Myp-Od? ): Earns 200 bucks and 20 XP every 12 hours. -Barney's Bowlarama (Requires Pin Pals): Earns 105 bucks and 11 XP every five hours. Comes with Barney. -Try-N-Save (Requires You Can Try-N-Save, But You Won't): Earns 60 bucks and six XP every two hours. -Blue Funzo (Requires Funzo Mania): Tap the Funzo to make it speak. -Purple Funzo (Requires Funzo Mania): Tap the Funzo to make it speak. -Pink Funzo (Requires Funzo Mania): Tap the Funzo to make it speak. -Santa's Little Helper (Requires Santa's Little Helper): The Simpson's faithful pet dog. -Lamp Post (Requires Level 17): Improves your Vanity rating. -Cannon (Requires Krustylu Studios): 0.50 percent bonus money and XP to all Jobs.